Recently, I bought such a USB TV Receiver. This is a little neat USB-Stick which is capable of receiving analog TV and DVB-T. Unfortunatly, I could not find an Linux driver for this beast by Januar 2006. 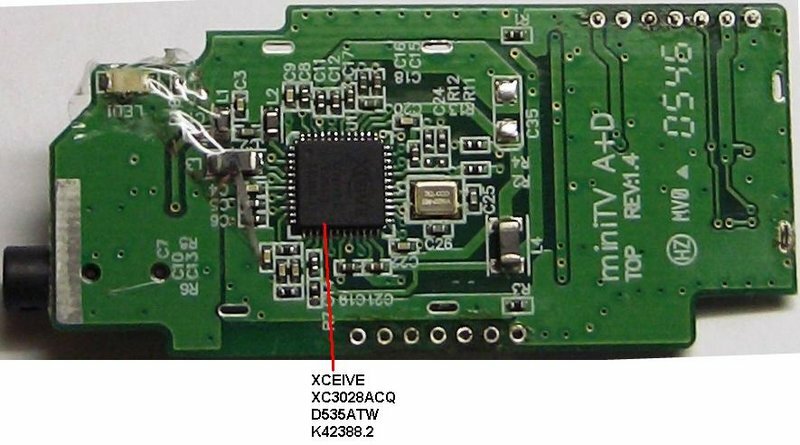 So, I started to do some research on this USB-Receiver. But since end of march there is a working linux driver. Thanks a lot to Markus Rechberger who did develop this driver. I did log the USB traffic between Windoz XP and the stick on my Laptop. After I installed the driver software I saw 3 new device with the same VID:PID (0CCD:0042) in usbsnoop. Actually, you see 6. I have two connectors and as I plugged it in to the second one I got an other 3 entries. I logged only one devices at at time. And I never saw something on the "USB-Verbundgerät". - After start of "Cinergy TV" (analog) file size grows until I stopped the app. I started channel scan, but the app is always streaming -> the noise? - After start of "Cinergy Digital 2" (DVB-T) file size grows until I stopped the app. I started channel scan, but the app is doing something I don't think streaming. Some experimental code from Markus is in Mercurial at www.linuxtv.org (2005-03-11). This page was last modified 17:20, 4 September 2006.